Short on garden space? Then a potato tower or potato box may be just what you need and we can show you just how to build a grow tower. We currently have a smaller yard that we have worked hard to create an attractive edible landscape. Growing potatoes in the ground doesn’t exactly conform to the small tidy asethetic we have going on. I had taken a class on intensive gardening and recalled there was such a thing as a potato tower. You can google potato boxes, potato towers, grow towers, and grow bags to get a visual on options. All of these items are ways to grow potatoes in a small spaces, however, some are more aesthetically pleasing than others. The basic idea of a potato box is you start at a bottom level and plant potatoes. Then as the potatoes grow you add a level of wood, fill in with dirt, leave a few leaves poking out the top, and continue on up. Growing potatoes in this method should yield potatoes all along the buried stems. The drawback to this method is you usually have to screw in each level as you go, buy tons of dirt, and it ends up looking like a plain wooden box. 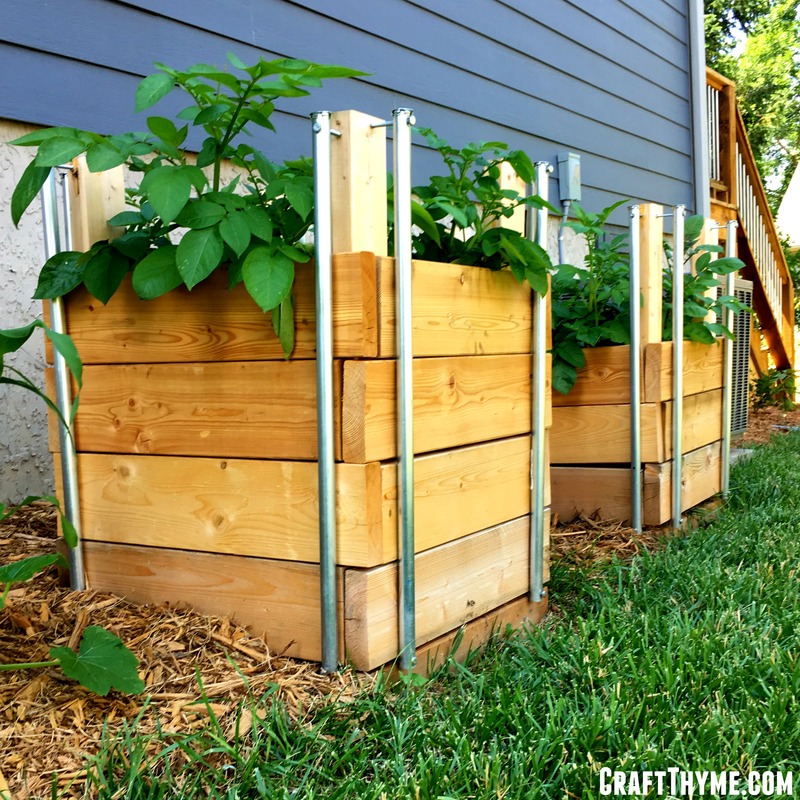 Don’t even get me started on the aesthetics of grow bags… While, we can’t help you with the dirt (it will take a lot), we did design a box with slide in slats, that matched the porch and trellises we have around the yard. 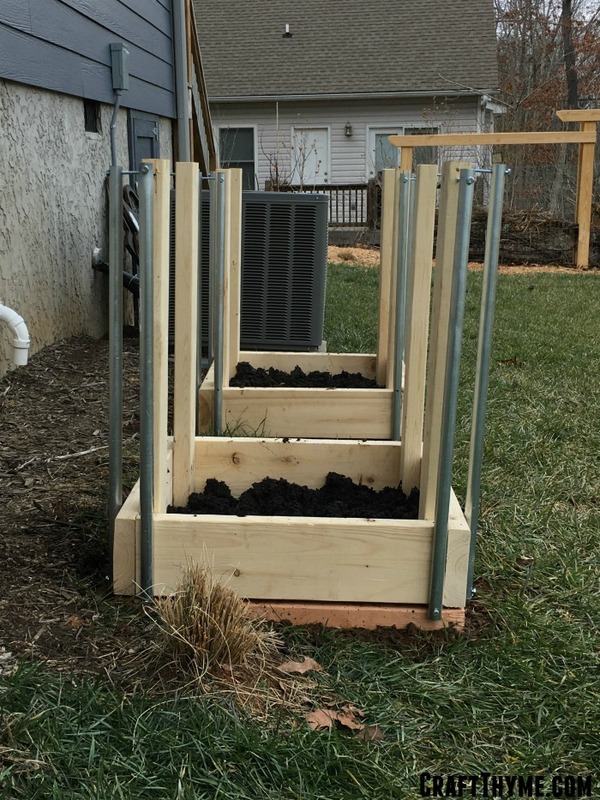 Using untreated wood (we aren’t huge fans of tons of chemicals around food we plan to eat), conduit, and some bolts, we made two potato towers that should last a few years. Construction of a potato box is rather straightforward – you’re just going to build a box several times over! But first, we need a frame…. Repeat this same process using your two remaining 33″ sections and single remaining 2″ x 4″ x 21″. Next, connect your two frames using the 2″ x 4″ x 24″ sections you’ve already cut. 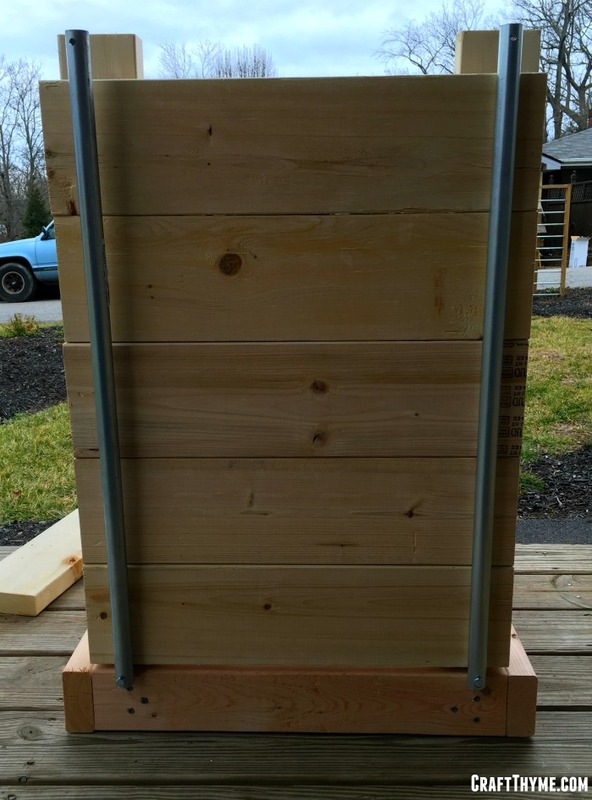 The 24″ board should fully overlap the existing frame. 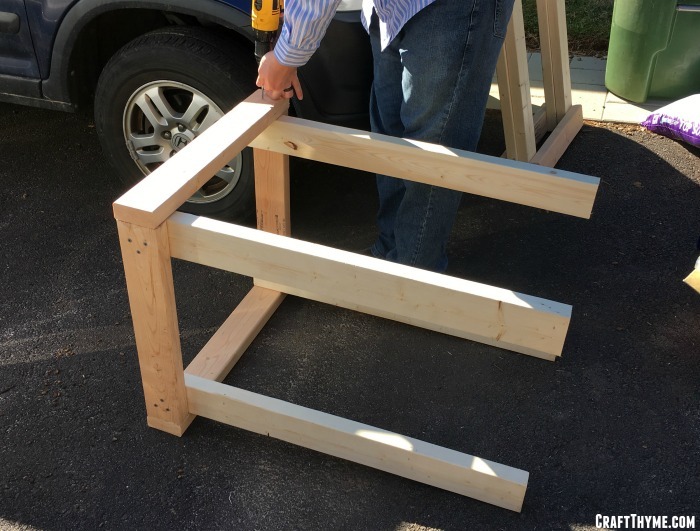 Once fastened with screws, the resulting frame should be 24″ square around the bottom. This is by far the hardest part of this project. This is where you put in the work ahead of time to make management of your potato boxes easy. This is where you wonder why you chose this route in the first place. This is where the desire for an awesome look and feel comes together and you realize it was worth all the effort. Why is this step so tough? In order to use conduit as a bracing mechanism, you’ll first need to drill a through-and-through hole at the top and bottom of each piece of conduit. Prior to drilling, mark your conduit 3/4″ from each end (and make sure your marks are in alignment!). If you’re using a drill press (highly recommended to make this process a breeze), clamp your conduit to your drill press base and slowly drill a hold completely through the conduit where marked. If you don’t have a drill press (like us), get ready for some fun…. Using a nail set/hole punch, make a small dent in the conduit where marked. This small dent will allow your drill bit to grab enough of the conduit to start drilling. Manually drilling into conduit is hard work. Even after punching the conduit, starting the hole may be easier said than done. Take your time and don’t rush the process. Wear safety goggles, be patient, and stay safe. Once you’ve drilled your 16 (gasp!) holes, it’s time to attach them to your potato box frame. 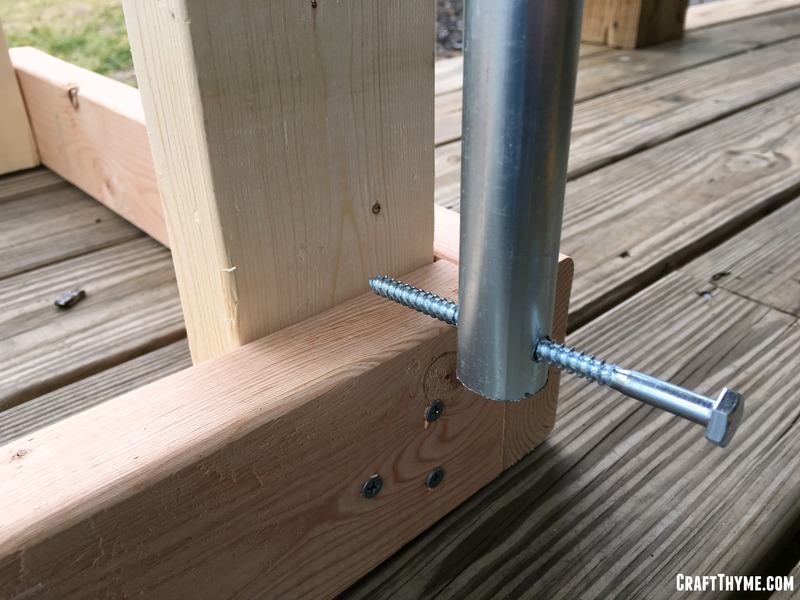 Using you 5″ hex lag bolts, begin screwing the conduit to the frame at the BOTTOM of the frame just above the bottom of the U. As you do this, use one of your 2″ x 6″ boards as a spacer. Repeat at the top of the conduit, then repeat for all remaining conduit pieces around the frame. Make sure not to over tighten the conduit at this step. You need to be able to slide the 2″ x 6″ boards in and out easily. If you did over tighten, back the lag bolts out just a bit and you should be good to go. Test sliding boards in and out of each side to ensure proper installation. If you’ve already cut your 2″ x 6″ x 21″ and 2″ x 6″ x 24″ sections, this step is complete! What do you do with them? Keep reading…. 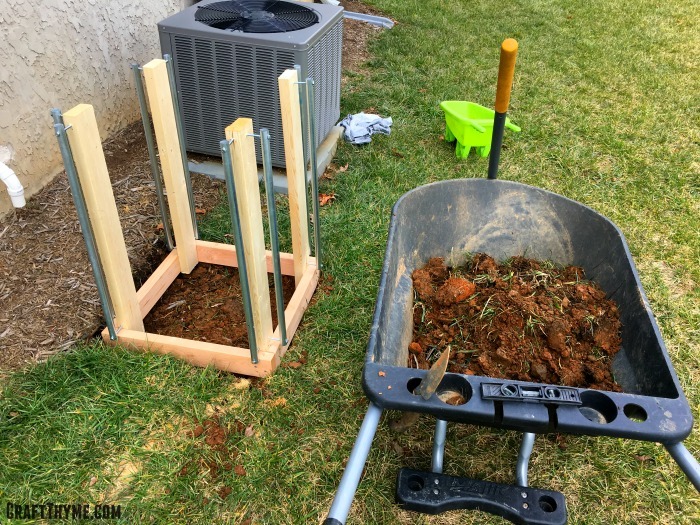 If you have a nice level surface all you will need to do is put your tower on the ground, remove all the slats, and fill the bottom with dirt. The frame and conduit make it nice and sturdy without a lot of fuss. Unfortunately for us we live in the mountains; level surfaces are in short supply. In those cases you may need to dig down slightly and make a level surface. Since we had gone to the trouble to make such pretty boxes we used them to screen our HVAC unit. The location meant that the backside of our boxes were slightly covered. I figured, no big deal, as we were going to fill the first level with dirt. In fact I used some of the excavated soil to begin filling the bottom of the boxes. While there are lots of techniques and details for growing potatoes in potato towers we are just going to go over the basics in this post. I highly suggest starting with a quality seed potato (Affiliate links to follow). Luckily my favorite seed store, Sow True Seed, also has seed potatoes! They even taught a potato planting class for free. Love local companies! We pre-sprouted (chitted) our potatoes, which involved setting a bunch of potatoes next to our grow lights a few weeks in advance. Then we simply made sure each piece had at least a few viable sprouts put them in the dirt and covered them up. Just water and go. They have shot up much faster than expected so we have already had to put in a few levels and more dirt. The one drawback of this method is the need to haul in soil. However, my plan is to use the pile the dirt behind the boxes at the end of the year and mix in chicken manure to let it mellow all winter. I figure after a couple of uses I’ll move it to the raised beds and get some fresh soil. Basically making an in-place crop rotation. The nice piece about using the slide in slats is that we are going to attempt to pull out some potatoes mid-summer. Slide out a slat, reach and and pull some potatoes, replace the dirt and put the slat back. Not sure if it will work as expected but figured that is half the fun of gardening: Experimentation Potato Box Style! Nice design but I was wondering if you have any issue with sliding the boards after they have expanded due to moisture absorbation. I live in the PNW and see my deck boards expand so thinking these might do the same. Thanks. We didn’t really have any issues with most of the boards. I got a couple neat the bottom or top where the screw is in, but just used a rubber mallet to get those couple going. Otherwise, they slide out pretty easily. 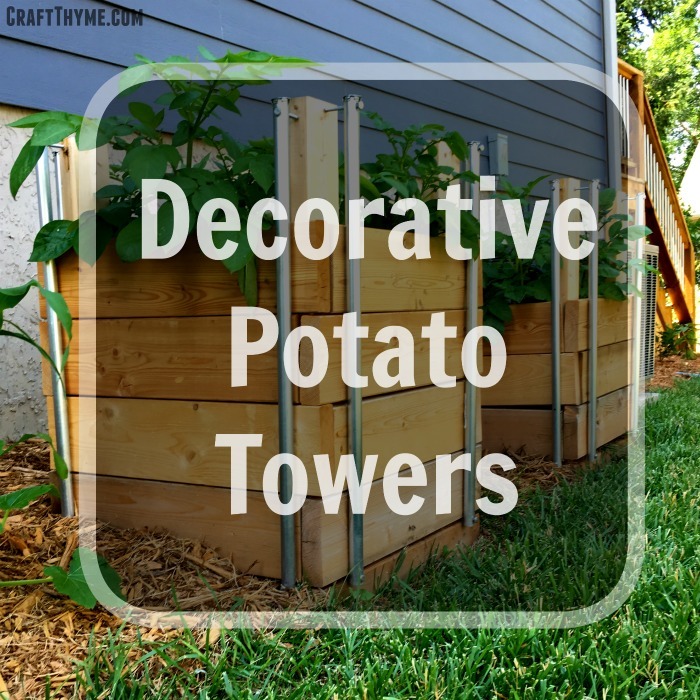 How do you water your potato towers? Ours will be too far away for a hose to reach so they’ll be on a drip system. Just curious how much water/how frequently you water yours! Thank you for sharing your idea – it’s fantastic! Thank you for sharing this plan for the potato tower! My question for you is how did you go about watering them and how much/how often did you water? Our entire garden is on a drip system and this will be far out in the back where there isn’t access to a hose. Looking forward to growing potatoes this year! I just watered them like the rest of the garden and if it was a super dry spell I might hit them twice a week. They do not get much drier than the rest of the garden as the wood doesn’t dry out like a terracotta pot would. The bottom is open to the soil below so drainage was not an issue. That is exactly how you do it. At the end of the season you pull up the boards slowly and let the dirt fall out and collect the potatoes. The dirt can be used next year from a pile, though, make sure to mix in lots of compost and nutrients as potatoes are heavier feeders. My ladies group (single, married, widowed) have decided we would like to build things for ourselves. So when we started making plans for this year’s garden, the subject of potatoes came up. I found your post on Pinterest and we linked over. They all looked at the plans and agreed they are quite doable. I looked at the same plans but saw something different. I saw this tower being built using PVC pipe in place of the metal rods. I’m sure it would be cost-effective and should be easier to drill holes in. That would be the only substitution I would make. Some of the ladies will be adding bottoms because they will be placing the towers on the corners of their decks and balconies. But I think the PVC would work since it is pretty rigid and will be used to form a cage for the slats. We’re in Texas, and February is 2 days away so we are ready to start building. So, what do you think? Thanks for reading and I’m a new subscriber! Hi, Mary! You can definitely go the PVC route, but I would suggest selecting as rigid of a product as possible in order to minimize flexing. Otherwise, it should work just as well! Enjoy building with the group. We would love to see pictures of your final product! How many potatoes did you plant in each tower? I am honestly not sure of the amount. I usually cram more than I should as I like small baby potatoes over the big honkers. Great idea! I’ve seen this done with 50 gallon barrels or drums. They started the seed potatoes in soil. As the plants grew they added mulch or old straw instead of soil leaving some green at the top. It needs to be thick so the tubers don’t burn (green from the sun) then you don’t need all that extra soil. I remember my dad growing taters that way and they didn’t need to be cleaned when they were harvested. I love this box idea. I will probably use old skids to buil the boxes as much as possible. Checking if they were treated with anything bad first. it worked really well. The foliage from the potatoes helped to cover the ground and prevent sunburn too! How very clever!! Thank you for sharing at Create, Bake, Grow and Gather this week. Great project! Pinned and shared. Love this design. Now I want to plant potatoes with my boys. Adding to my Pinterest queue. I’d love for you to join our link up To Grandmas House We Go. It opens Tuesday nights around 11pm ET. I may have missed something, if so, forgive me. Do you only plant the original chits at the bottom or have to add more with each layer? You just plant the original chits at the bottom. As they grow keep adding dirt. The stems turn into roots that grow more potatoes up the length of the plant. One thing we’ve been looking for is a way to get at potatoes during the growing season (“stealing from the bottom”). Did you do this? Were the slats easy to slide out and back in? Yes and yes. We were able to enjoy many fingerling potatoes through early harvest and the slats were quite easy to slide back into place. Omgosh, these are the best potato boxes I have ever seen! So, so clever! Thanks for sharing the tutorial with us at Merry Monday this week. I don’t ever think I’ve seen a garden box design like this before. This is awesome. Thanks for the DIY pinning for later. Brianna and Adam – this is so clever! I love the detailed instructions, too. Thanks for linking up on Tips and Tricks, happy Tuesday! I had no idea you could do this. This is a genius idea. It ends up looking like a regular planter but so much more functional. Very informative. Honestly I think it is attractive enough you could use it as a regular planter too! I have heard they are hard to grow which is why we have been hesitant to do it. So far got tons of leaves. We hope that equals tons of potatoes! Very well put together tutorial… how’d your crop come out? Happy with the number of potatoes? Did harvesting work the way you’d hoped? Thank you for sharing! I have always enjoyed gardening. Its a great way to get some extra veggies in the kids with a lower cost. Adam, I love these! We haven’t done potatoes because I don’t want to take up yard or garden space, but this would be awesome. I wonder if I could do them on the shady side of the house, which is kinda hidden from our patio area, or if the lack of sun would affect the growth of the potatoes? I haven’t fretted much about not growing our own, but like you, we use organic measures and if we can know exactly what’s on or in our potatoes that’s Priceless! BTW, I hope the new owners of the home appreciate all the special touches they are getting! Lucky them! I am pretty sure potatoes need full sun. One of the nice things about these planters is that I do not mind seeing them. You could technically put in a bottom and use these on a patio or hard surface area if space is lacking. This is a fantastic idea and it looks beautiful. Great tutorial on how to make these! This is SO SMART! I’ve never heard of a potato tower before. But, it’s a brilliant idea and I love how you made it simpler to add more as needed. I wouldn’t like having to screw more slats in each time. The way you made it ready ahead of time so you can just slide them in is genius! I’ve been wanting to grow potatoes for years. Right now I don’t have any space outdoors. You bet that once I get some space I will give these towers a try! I know! I was not about trying to find a drill every time I need to add a level. Drill once and then done! These really look beautiful, and I can only imagine how much easier they make getting the potatoes. The hope is there will be a lot less digging in the fall. Brianna…you are brilliant. Like you, I keep my vegetable garden organic and used untreated wood on all our boxes. We have grown potatoes in the past, but this is a fantastic way to get more out of each ‘seed’. And, it is good looking too! I’m all about functional aesthetics! What a great idea! Your boxes look great, and it’s such a handy way to add to it as they grow. Pinning! Thank you! I was super happy with how they turned out visually and they also seem to be working well. Great build tutorial, pinning this for later! This is really such a marvelous idea! You make it look easy. I also like the idea of using untreated wood. Who wants more chemicals in their food? It means we will have to replace them a few years down the road. But really they will last quite a bit of time. Very nice potato tower, very pleasing to the eye. Love the way you use the slates making it so easy to get to the potatoes. You make this look so easy, I think I may be able to tackle this project.